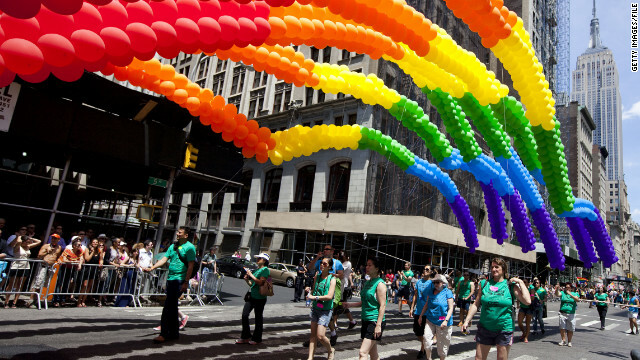 Gay pride is marked by parades, like this one in New York in June. LGBT month is meant to be more educational. (CNN) - American schools recognize African-American History Month and Women's History Month. This year, for the first time, two school districts are celebrating LGBT History Month, which started seven years ago and kicked off this year on October 1. The Broward County school district in Florida signed a resolution in September in support of Lesbian, Gay, Bisexual Transgender Americans. Last week, the Los Angeles school district, the nation's second-largest, also signed on. The two districts have more than 1 million students. "I want LGBT students to see their education as the diamond, their joy in their life rather than their trauma,” said Judy Chiasson, diversity coordinator for Los Angeles schools. Last year, California passed the FAIR Education Act, which requires public schools to teach LGBT-inclusive history. California law already required state public schools to teach about the contributions of Native Americans, African-Americans, Mexican-Americans and Asian-Americans, among other groups. Democratic Sen. Mark Leno, who sponsored the legislation, said at the time that research shows that students who learn about LGBT people are more likely to report that their schools are inclusive and fair. However, the bill drew ire from religious and conservative groups, like the lobby Traditional Values Coalition. Equality Forum, which sponsors LGBT month, is featuring a LGBT icon every day in October. Among them are author Truman Capote, designer Jean-Paul Gaultier and CNN anchor Don Lemon. The icons whom Equality Forum highlights with online educational resources and videos are, said Executive Director Malcolm Lazin, the Martin Luther King Jr.s of the LGBT world. "The LGBT community is the only minority community that is not taught in schools," Lazin said. "So no wonder homophobia exists." He called the recognition in the two school districts a "giant step in public school embracing LGBT inclusion and respect.” LGBT month will help children learn about the the role of gays and lesbians, he said, and help "break the cocoon of invisibility" for Americans who for many years have remained under the mainstream radar. But 14,000 school districts have yet to adopt LGBT month, which this year kicked off with a road dedication ceremony honoring lesbian activist Barbara Gittings in her hometown of Philadelphia. A red sign heralding Barbara Gittings Way was placed under the name of Locust Street between 12th and 13th in the city's "Gayborhood." Gittings edited the first lesbian publication in America. She persuaded the Library of Congress to include gay and lesbian books in the nation's card catalogs and libraries. And, with Frank Kameny, she successfully challenged the American Psychiatric Association to remove the classification of homosexuality as a mental illness. Gittings, said Lazin, was a woman who came out in public to fight for gay rights at a time when many gay Americans did not even dare to come out in private. To those that say that being gay is a choice or simply a lifestyle, your views are mistaken. The LGBT community never chose to be what they are, and it's more than a lifestyle. It's a life with style and a life with love between people who deserve to have the same rights as straight people. I'm an transgendered boy whose an older brother to a gay sister, and I see how much damage the phrases, "being gay is a choice" and "you picked this way simply because it's a lifestyle endorsed by the media", can do to a member of the LGBT community. We're a people a minority who deserve to be able to love and be recognized for who we are, not crushed or belittled simply because we are different. PS: Ladies and gentlemen, I ask that if you've got nothing nice to post, don't post it. My request may seem childish, and I know that many of you will ignore it, but still. CNN welcomes a lively and courteous discussion. When you start crushing or hating on people simply because of who they are or what people have done for them, then you leave that realm. When you do that, then your posts shouldn't be here. if you have a kid in the Los Angeles Unified school District...next parent conferance you have..ask the teacher where Did their kids go to school. Funny how it's always private school or home school. Sadly the reputation of America is going that way. This is coming from someone who lives in Toronto and is visiting her Dutch in laws in Holland. I'm more respected as a transgender woman than I am as an American. Once I heard a teenage girl whose parents had recently moved from overseas (very legally) to a city in the Deep South say that she would rather be gay than be with any of the slovenly, odoriferous, disrespectful, immature boys in her high school. She said that she had never seen boys like that in her life. Heads up, guys. Wow, some people should not be allowed to own a computer or have an internet connection. every month is straight month. In the minds of the Liberal Left, if you're white and straight, then you're what's wrong with America. These are times to celebrate! So many young people who have died because they didn't have a shoulder to cry on, they didn't have a word of understanding telling them they were beautiful as they were. As long as there are people who listen to their hearts and respect diversity, they will never be forgotten in each of our efforts to globalize Human Rights in general and diversity in particular. I wonder how many have died because they were told from an early age that they were different by their different parents and by the time they were old enough to make their own choice they were so messed up in the head that death seemed to be the better choice. what about the people that died from that non cureable virus? You mean black history month?